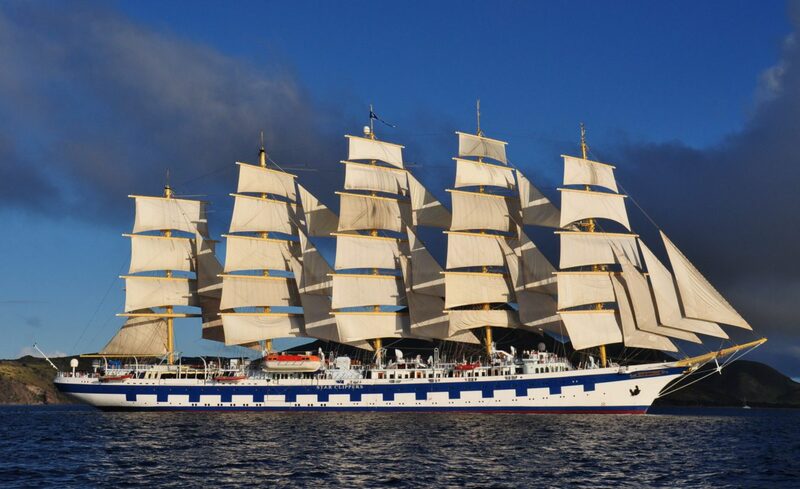 The past two days have passed very swiftly on the Royal Clipper. On Tuesday, we were on the island of Antigua. As usual, we anchored away from the city center (St. John) at Falmouth Harbour. What this means for passengers is that when you go ashore, you really won’t find much except for a few small stores and restaurants which cater to yachtsmen. As usual, the ship ran two tenders: One to the marina and one to the beach. Chet and I first visited the marina and then walked about 20 minutes to the Pigeon Point beach where the ship held a barbeque for lunch. We then spent a couple of hours swimming and snorkeling from the beach. Yesterday we visited the small island of St. Kitt’s. Chet and I opted to take a shore excursion here, a trip on the St. Kitt’s Island Railway. This company began seven years ago. It renovated an old sugar train that now takes visitors on an informative trip ¾ of the way around the island and then completes the circuit by bus. We enjoyed this excursion as it gave an in-depth view of the island. The capital of Basseterre has greatly expanded in recent years. A land reclamation project has enabled them to build a new cruise terminal area called Ponte Zante with many upscale shops. After dropping us off for excursions in the morning, the Royal Clipper moved to another part of St. Kitt’s for our time on the beach. Paula and Carl reported very good snorkeling from this beach. On Wednesday morning, just before our shore excursion, we learned that a tragedy occurred late the day before on Antigua. A passenger from our ship was found killed on the beach at about 5 p.m. (not the part of beach that our group was on). The young woman had last been seen at 3:30 p.m. after being part of a snorkeling group. Of course, we do not know who perpetrated the crime and the ship was in no way connected to this reprehensible act. Her family disembarked the ship that night and sailing was delayed by several hours. Word spread quickly through the ship about the crime although few specific details were known until later in the day. Just before dinner an announcement was made that a family had disembarked because one of their party was missing and asked that any passengers with information should report it to the police. Then we were asked for a moment of silence. All in our group felt that the ship’s officials should have been more forthcoming. Since then she has been identified as Nina Elizabeth Nilssen, age 30, of New Mexico. What is especially tragic is that she is the sister of Liv Nilssen, who was married onboard on Sunday, and was part of the wedding party. She was found partially clothed and was stabbed in the neck. An autopsy showed she died of exsanguination. No one has been apprehended as of yet, according to local Antigua newspapers. I think that this incident reinforces a fact of travel that we should never forget. That crime exists everywhere, be it Palm Beach, Thailand, Easter Island or a Caribbean island and we should always be mindful of our personal safety. We should always travel with another person and not go off with people we do not know. This is just so sad. In my next post, I will discuss how the matter was handled (or, rather, not handled) on board the ship. On a more uplifting note: Last evening the ship sailed at 5 p.m. and passengers were given the opportunity to board a tender to go out and take pictures of the ship under full sail. So at the top of this posting is a lovely photo taken by Chet. The ship should have never left without doing a full investigation. A couple was murdered a year ago near the same place Nina was found and they were together. So it’s dangerous to walk the beaches during the day with or without a friend? Also, a Jamaican business owner was gunned down about 4 months ago and they still can’t find the murders. You can paint the prettiest picture of this place all you want but the fact remains that Antigua has a serious crime problem that needs to be address before more people die. Most of us on board were very uncomfortable with the fact that the ship sailed away in the night when none of us onboard were yet aware of what happened. I do believe that the ship should have stayed at least one more day in case we could have assisted the police investigation in any way. And we might have provided a bit more support to the family. I spoke with Star Clippers public relations folks this morning and they were well aware that the ship had no plan in place to handle a crisis of this magnitude. I gave them my unvarnished opinion of how things were (mis) handled on board.